Motorola is really quick in releasing Android update in recent years. You can get latest Android at the similar time frame as Google Nexus device owners. But some Moto G, Moto X and Moto E owners are still confusing on software update. This guide will try to show you the details of software update for all Moto devices, including Moto G, Moto G 2nd Gen, Moto G 3rd Gen, Moto X, Moto X 2nd Gen, Moto X 3rd Gen, Moto E and Moto E 2nd Gen.
Why update Moto G, Moto E and Moto X? Moto G, Moto X and Moto E are running Android, which is updated by Google regularly. Once a new version or an update is released by Google, Motorola, like other Android manufacturers, need test it on all their devices to decide whether they should update Moto G, Moto X or Moto E to this version. So, it is usually recommended to update Moto G, Moto E and Moto X once the update is available for your device. Of course, as software, it is not uncommon that new Android update for Moto G, Moto X and Moto E brings new bugs, and may cause new problems. Some Moto G, Moto X and Moto E owners use this as an excuse to avoid the update. If you don’t update Moto G, Moto X or Moto E, you may have other issues, for example. your phone may be less secure if you skip the security update. your may not able to run some apps which require newer version of Android. you may miss some new cool features. Anyway, it is up to you to decide whether you update Moto G, Moto E and Moto X, or not. or from your PC through USB connection. How to update Moto G, Moto E and Moto X from your phone (OTA)? To update Moto G, Moto E and Moto X from your phone (OTA), you may follow these steps. Although Android update is supposed not to change any of your files, contacts, messages and settings, you should backup your phone before a firmware update. Anything can go unexpectedly during a software update. Actually, you should regularly back up your data regardless of update. Most of the data (e.g., contacts, photos, files…) can be easily backed up to your Google account in the cloud. For OTA update, you need connect to Motorola server or your carrier’s server to check and download the update. So, an active internet connection is needed. You should try to use WiFi if available. You can turn on WiFi easily in quick settings panel. Of course, if WiFi is not available, you can use mobile data. Please note, the size of the update file usually is up to a few hundreds of MB. Make sure you have sufficient data allowance in you mobile plan. If you already received the notification that update is available for your Moto devices, you can tap the notification to download, and skip this step. You can now check whether you can update Moto G, Moto E and Moto X in Settings—About phone—System update as shown below. If update for your Moto G, Moto X or Moto E is available, you can choose to download. Once download is finished, it will prompted you to apply the update. The phone will then reboot to apply the update. Once the update id applied to your Moto G, Moto E or Moto X, the phone will reboot into the updated Android. So, please be patient and set aside 20-60 mins for the update. Normally, you can enjoy the updated Android on your Moto G, Moto E or Moto X immediately after the reboot. But sometimes, some owners may face weird problems or feel the phone is slower. Quite often, such problems are caused by the cache partition. Anyway, after you update Moto G, Moto E or Moto X, you may try to clear the cache partition following this guide. How to update Moto G, Moto E and Moto X from your PC? You can also update Moto G, Moto E and Moto X from your PC through USB connection. But you need make sure your Moto G, Moto X or Moto E is recognized by the PC by following this guide. 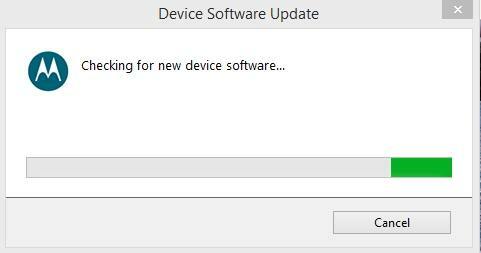 The Motorola device manager you installed can also check the updates. To update Moto G, Moto E and Moto X from your PC, please follow these steps. As detailed in this guide, make sure your Moto devices are recognized by your PC. Start Motorola device manager on the PC. 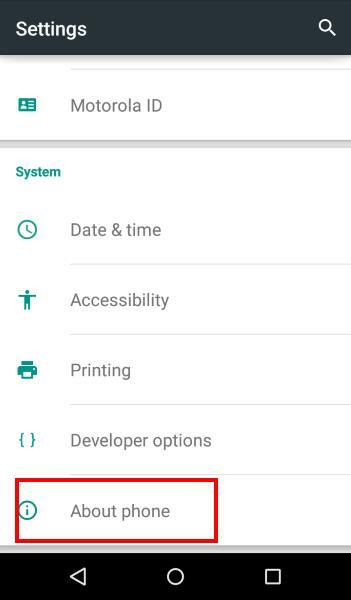 Once the Motorola device manager is started, it will search for update automatically for the phone connected as shown below. If update is available for your Moto G, Moto X or Moto E is available, you can follow the instructions to update your device. Why I cannot update Moto G, Moto E and Moto X? Very often, you may read from news that Android update is available for your Moto G, Moto X or Moto E. Some owners are discussing the new features. This is not uncommon. Nothing wrong with your phone. Because Motorola sells phones in many regions, the update in some regions may be rolled out later than in other regions. In addition, all major update need approval form carriers for carrier specific models. Some carriers may take longer time to test and approve the update. So, it is not strange, in the same country, some owners get the update, some not. You have to wait. The update will eventually come to your phone. I don’t like the update, how can I roll back to the old version? After you update Moto G, Moto X or Moto E, there is no official way to roll back! In other words, even you reset the phone, it will still be in the updated version. If you really need roll back to an older version, you have to visit local Motorola service center to flush the firmware. Do NOT flush firmware by yourself unless you know what you are doing. You may damage your Moto G, Moto X or Moto E.
Can you update Moto G, Moto E and Moto X now? If you have problems or questions on how to update Moto G, Moto E and Moto X, please let us know them in the comment box below. I think, every body who has Moto g might be facing such problem. I shall contact the Motorala Local Service Centre. Thanks for information. 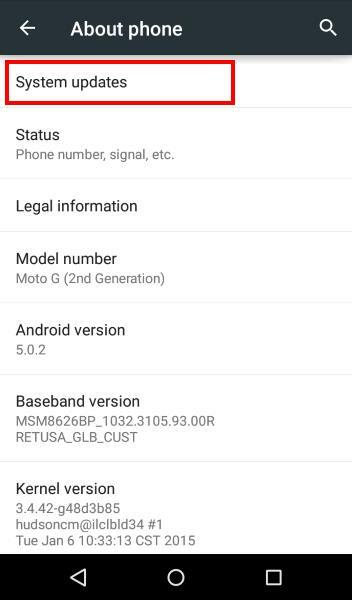 I purchased moto g in Aug 2015 in India with kit kat and latter updated Lollipop version when notification came to me. After installation of new Lollipop, I have noted that volume of rigtone do not remain fixed causing difficulty in atteñding calls. Ringtone Volume varies along with volume of music and other. There is no other choice to fix Ringtone Volume as it was I’m KitKat. The ringtone volume settings are separated from media settings. You can check the volume settings in settings. However, Moto G uses ascending volume for ringtone. You cannot disable it by default. There are a few apps for this. But most don’t work. The volume button is context sensitive. If you are playing media, the volume button will adjust volume for the media. If no media is being played, or the app is not using volume button, yes, it will adjust your ringtone. There are no settings to change this. Almost all android phones work in this way. This is a bigest draw back of the android phone. As I remember, such problem was not with kitkat version. Such problem must be addressed to the Developer of the Android System. Can you please pass on the problem to the concerned agency or can you please give me their contact details so that I may put forward the problem to them for future updates. I don’t think there is a public feedback channel. You have to go through local Motorola service center or authorized partners.